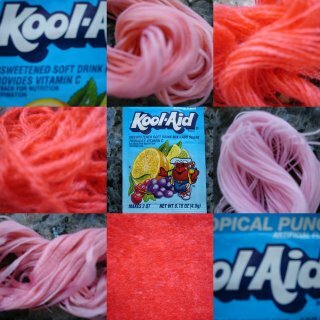 Heaven knows what a child's insides look like after they've drunk this stuff, but I'm more than happy with the results of my test-run Kool-Aid dyeing this afternoon. I followed the knitty.com recipe and concentrated on the primary focus - the samples of wool felt I have. Of course, I couldn't throw away some perfectly good dye liquor, so I dumped a few odds and ends of threads in. The wool works perfectly, the cotton not so - the three pink samples above are all cotton/rayon embroidery threads, but will tone with the wool felt on the little project I have planned. This test run used "Tropical Punch" flavour. I have a collection of every Kool-Aid available in Manhattan, (thanks Jordi!) and some extras from California (thanks Mary!) I even have some "invisible" flavour, which I confess to buying myself. Not the brightest choice when I thought of it. I will soon have my hands on several yards of the wool felt, which is destined to be dyed in every colour and samples shared amongst friends in a bit-of-a-swap we've planned. Watch this space for the results. Incidentally, half way through the microwave process, Edward wandered in, attracted by the sickly sweet fruit-drop scents which were wafting through the house. Once he found out the cause, he was appalled, but I think there was the tiniest hint of disappointment that something edible was not going to appear on the kitchen table this afternoon! Jul 4 Is that it? !